Susannah Drake is the founder and principal architect of DLANDstudio. This fall marks her 20th anniversary since graduating from Harvard GSD with both architecture and landscape architecture degrees. She has been doing architecture and landscape architecture since 1988. Last week Modelo spent some time with her at DLANDstudio’s office in Brooklyn, New York. I founded DLANDstudio in 2005. I’m both an architect and a landscape architect. When I got out school with both degrees people didn’t know what to do with me. I would go to the architecture firms and they would say, “well what do you want to be? Do you want to be an architect or a landscape architect?” And I would say, well I really want to do both and I want to do them synthetically. I ended up getting a job with a large firm that does a lot historic preservation work because they were doing adaptations of aging infrastructure — a firm called Beyer Blinder Belle and I learned a lot. It was a great place to start but the firm compartmentalized infrastructure, planning and architecture. After a few years I ended up leaving and going to a firm called Rogers Marvel. It was an experiment for them to hire me because I had both degrees and they thought, let’s see what she can do with that. I helped to develop their urban design practice and their campus planning practice to a point where it got to be about a third of their business. It was wonderful being there, a great work environment but I thought ok I have the ability to generate work and I have things I want to do that I don’t think I can do working for other people. So I left to develop my own vision and founded DLANDstudio. I needed to figure out what my voice was and then use the practice to explore different ideas. When I started the firm I applied for a bunch of grants to do research. And then I went out and hit the pavement to find paying jobs. The combination of grant work with research involved and having other projects that are the proof of concept has been really fruitful for me. We’ve built the platform of making projects up and then making them happen into something that’s quite powerful. Well when you’re first starting out you’re really scrappy. You’re taking every project and developing priorities. You also take a lot of work for free because it’s interesting and helps to gather information and experience. I would say we’re still gathering information and talking to a lot of people and thinking about a lot of different ideas, but we’ve developed methodologies that are very effective for starting to design and build our projects. We’ve gone from pursuing small grants to do more academically oriented research to now doing work that has to do with major infrastructure projects which might benefit public agencies, and we’re figuring out the systems for how those ideas might be able to deployed on a larger scale. That’s a really hard thing because it gets into policy and it gets into economics and gets into community development and even procurement issues. So we’re right on the cusp of figuring out effective roll-out systems for these ideas. It’s become much clearer how this vision can become a reality. Our firm is small only 10 people but it’s kind of like a little thinktank. I have people who are really smart with experience and pretty terrific academic backgrounds coming from great schools. These are people with backgrounds in civil engineering and graphic design and architecture and they all come together in a great way. I’ve even had an astronomer at one point and a biologist. I like people who are just good thinkers. We are a very collaborative office because we’re small. We talk and develop the ideas together. I look for the best designers I can find who can design on the computer, draw, make models and write, and finding that combination is challenging. Design practice involves all of those things. You’ll sketch out your ideas by hand and possibly scan those in to share with a client. You’re constantly sending emails or you’re putting together proposals which need to be well crafted and you’re presenting visual information that needs to be beautiful and well thought out and technically perfect. So I look for people who are just really damn good (laughing). When we are just starting out on a project like the QueensWay or a competition, we’ll come up with ideas independently — our initial impressions, do some research and then come together at the table in our office and talk things through. Some people will be bringing visual material and others will bring written material such as synopses they’ve done. But the discussion of all that information helps drive the project forward. We look at that information and determine who will be developing what. We divide up the tasks within a job, within a design idea and further develop them while continually checking back and forth. Ultimately when we have to produce we’re all going off in our own spaces and producing the document and then bringing everything back together again into the entire project. That’s how we manage the design. In terms of the construction, we do a lot of public work so that has many additional layers of complication. Many of our projects work between a lot of different public agencies and regulatory bodies. The land may be owned by the DoT but there’s park space on it so you get Parks involved and there’s water on it so you have Department of Environmental Protection and it has a brown field so you have Department of Environmental Conservation and it’s on a waterfront so you have City Planning and SBS. We seek out the most complicated projects you can imagine. It’s kind of crazy (laughs). We do a lot of work with storm water management and green infrastructure and those projects tend to be on really complicated sites. I care deeply about communities and the environment but part of the reason I operate in the margins is because I’m a small WBE (Women Business Enterprise) and when I started my practice I was looking for ways to make an impact on urban public space. Public agencies and conservancies don’t give the parks to a little new firm. Older entrenched offices get the projects. So I started looking at infrastructure projects because it wasn’t cool then — even though now it’s become cool. I was looking for a place where I could have a voice and urban and ecological systems had always been an interest. I would say a lot. Yeah. We do a lot of 3D modeling of the projects. I like building physical models but we don’t do it as much any more because the 3D computer models are so useful because you can go in and look at so many different views. With a lot of the early work that we did we would build a 3D computer model in Rhino to generate the perspectives so that the perspective is right on. I hate seeing bad perspective drawings where people have faked it in photoshop. There’s a lot of it out there. We do a mixture of Rhino, 3D Max and 3D AutoCAD and GIS which is different. We don’t do sketchup. I think it’s pretty awful looking. We’re looking for software tools that are even more dynamic now, that can model elements of time. Like if you could build in parametrics into your 3D software. You could watch plants grow for instance. Here’s a landscape now and here’s a landscape in five years; the software could animate that. That’s one simple example but there are lots of dynamic issues in landscape architecture that would benefit from that kind of thinking. I’m hopeful that landscape architects are really leading more large scale urban design projects because we really know more about more things at a larger scale than a typical architect does. While I really like working with civil engineers, they tend to be very focused of necessity on very specific parameters and don’t have inter-disciplinary training. Architects have the interdisciplinary training but specifically at an architectural scale. In landscape architecture we don’t necessarily study structure the way an architect does. I know because I studied both and am registered to practice both. I think at the building scale an architect is better but at the landscape urban design scale the landscape architect has a lot to contribute that could make cities work better. I’d say it’s starting to happen but it wasn’t necessarily happening when I started my practice. I think landscape architects are gaining ground. I’m really glad I’m both because I can understand how systems all work together. I am hopeful that we will see more of that kind of interdisciplinary education in the schools in the future. That remains to be seen. There is a big opportunity specifically in regard to making cities more environmentally productive. We did a project for the Museum of Modern Art in 2010 it was before Sandy but it was post-Katrina. We knew a big storm could happen. We just didn’t know when. And there will be other storms like that, other severe impacts on the urban landscape. So we need to predict or project what the city can be in order to work with the landscape instead of work against it. What I’m really trying to develop, are methodologies to help the city work better now, but also be able to bounce back from a major storm event. This applies to more than just coastal cities. 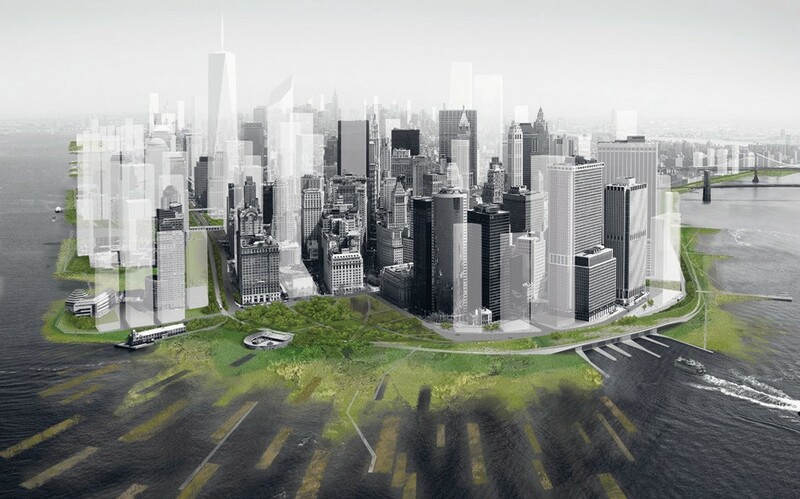 So with that MoMa project again designing upland areas to soak up stormwater of a big rain so that the streets can absorb it and keep large amounts of combined sewage effluent out of the harbor. In some sewer shed areas it only takes .2 inches of rain to trigger a combined overflow. So while we are dealing with infrastructure and sewage these systems ultimately affects people’s lives. Our work makes the city a cleaner, healthier environment and that makes it more liveable. We already have a number of prototypical systems which we’ve built. We have systems for managing storm-water that comes off of raised highways. There are over 7,000 miles of raised highways that go through cities. So we have this way of taking the water and using it so it doesn’t go into the combined sewers. We have 3 prototypes and we’re working on a fourth system to deal with the issue. I want to make the eco-jersey barrier. Something as ubiquitous as a jersey barrier but something that’s actually ecologically productive benefiting the environment. We have a few typologies in the works. We’ve got the system to manage the water from raised highways. We’ve got a project we called the SpongePark to deal with water on urban street ends. We have on-call contracts in a number of vulnerable places: Miami, New Orleans and here in New York. We’re looking to get on-call contractor roles in more cities so we can develop these ideas and roll them out. My business plan for the next five years is to get more of these on-call contracts. Meanwhile we’re doing some really beautiful high-profile design work, like the new 3.5 mile long QueensWay rail-to-trail park Trust for Public Land for Friends of the QueensWay. So ultimately we’re not just about doing the gritty infrastructure, we’re about making places for people and our infrastructure isn’t even gritty, it’s pretty. It’s green.